Cornell Cooperative Extension Albany County is committed to providing education and trainings on lead poisoning prevention. Listed below are several resources and opportunities, most of which are free. For contractors, tradespeople, landlords, and individuals interested in becoming an EPA certified renovator, Cornell Cooperative Extension Albany County is accredited by the EPA to provide certification to participants successfully completing the Lead Renovation, Repair, & Painting Initial course and the Lead Renovation, Repair, & Painting Refresher course. Currently, classes are offered three to four times a month in Albany, Rensselaer, and Schenectady counties. There is no charge for the RRP I or the RRP R trainings, however pre-registration is required. Funding is provided by Albany County Department of Health, Rensselaer County Department of Health and Schenectady County Public Health Services. Register online for an EPA RRP I and EPA RRP R lead training. Lead paint was banned in U.S. residential paint in 1978. Three-quarters of the nation's housing contains lead paint. Lead poisoning is a serious disease. Children under six are most at risk. Children from every region, race, and socioeconomic level are at risk. Lead poisoning causes learning and developmental disabilities. Even children who appear healthy can have dangerous levels of lead in their blood. Most lead poisoning happens at home. The primary cause is tiny particles of lead dust from deteriorated paint or from painted surfaces disturbed during remodeling, repair or renovation. Lead dust is invisible, so tiny in fact that it passes through most masks & filters. Lead poisoning affects adults as well as kids. Cornell Cooperative Extension Albany County offers free resource information, programs and trainings on lead awareness and prevention. Contact Nancy Lerner at NKL1@cornell.edu or 518-765-3521 for more information. The National Lead Information Center offers resources via a toll-free hotline at 1-800-424-LEAD (5323). Visit our Indoor Air Quality page to learn about lead in your home. Want to be listed in the EPA Certified Renovators Directory? Cornell Cooperative Extension Albany County continues to compile and update a list of US EPA certified renovators that are published in a print and online directory. 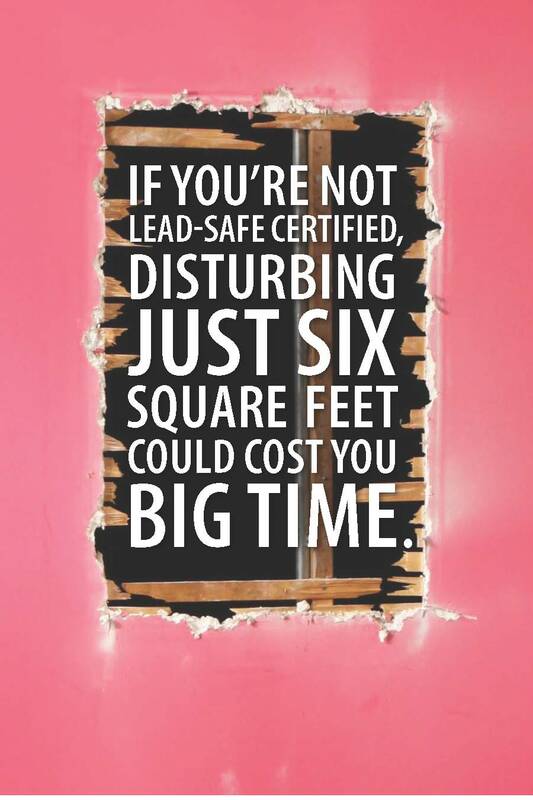 CCE Albany County is committed to promoting EPA certified renovators who use lead-safe work practices to reduce lead poisoning. To be included in the directory, you must be a US EPA certified renovator and either be employed by or own an EPA registered firm. There is no charge for this project. Directories have been and will continue to be distributed to area households, community organizations, and agencies. The listing is also available online. Funding for this project is provided by the Albany County Department of Health, the Rensselaer County Department of Health, and the Schenectady County Public Health Services.